What's in a name, how is it spelt and why was it used? To start with I have always heard the term THAMESITE used for people who were 'real' Thames folk! People who had their roots and foundations firmly from the goldmining years. Those families that first settled on the Thames goldfields and even after many left, they would still fondly call themselves a THAMESITE. The question today is the spelling...I am often swayed by others that it should be THAMES-ITE. So to resolve this once and for all I went to Paperspast and searched for both terms. The Thames-ite seems to bring upa handful of false results, whereas the term THAMESITE brings up 378 results. The first example was by Mr Macdonald in 1876. The Concept of being a Thamesite remained strong over the years, and there is nothing these old Thamesites like better than a good old reunion! 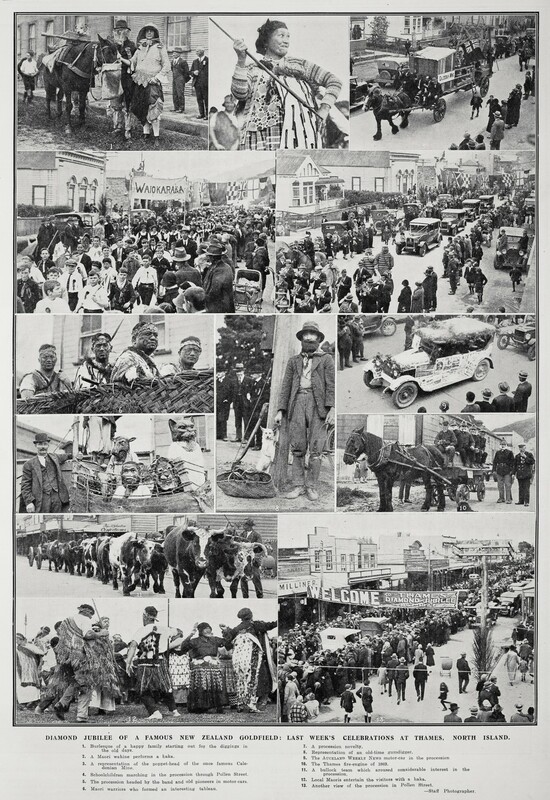 The 1927 Diamond Jubilee was just one excuse for a massive gathering and parade, as so beautifully portrayed in the Auckland Weekly News 11 August 1927. The last entry at Paperspast for Thamesite was in the Auckland Star 1 June 1936, when a reference was made to a meeting. It summed up early memories that many will have of ex town folk making the Sunday trip for cuppa with the relatives...then going back to Auckland. Over the years as generations have died and there are no longer Grandparents to visit, these trips back home, for many, have become a thing of the past. As more and more people explore their past and genealogy, thanks to places like The Treasury - they often find relatives who have passed through Thames, and we can say...yes you too are a THAMESITE! An ongoing plea for anyone who has old photos of Thames - NEVER throw them out, The Treasury at Thames is always interested in old photos and you can donate the photo or a good digital image. The collection continues to grow, so please go and check it out when passing. My last few days have been occupied exploring the images at Auckland CITY Libraries online collection. You can access this indirectly via the MATAPIHI site (and then filter your results) or my preferred option is the Libraries Heritage Image link. Take a look at this image online or below. The image provided by Auckland Library shows three hotels and four shops that had previously not positively been identified. The photo looks down on Rolleston Street, the hospital would be to the right and the road runs out to Banks Street. 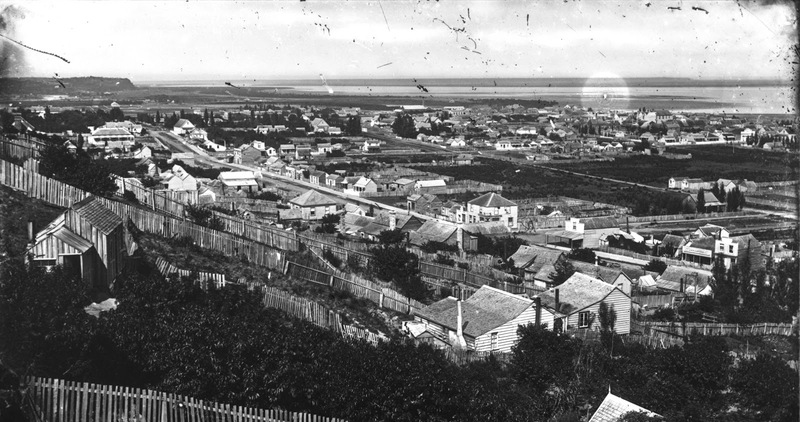 In the early days this would still be called Bowen Street from the Hape Bridge. Near the centre of the photo, stands a two storied building - that is the GLOBE HOTEL. Remember when hunting for information on Thames-ites to check out the digital collection at Auckland City Libraries Website. Examples include: Auckland Passenger arrivals, 1881 Electoral ROLLS plus many more. Apologies to those new to the blog, who may wonder why my website does not update. Failed computers and new software have meant it is a challenge to update those pages...so for now I keep you posted via this blog. I am up to the letter N, updating my research into Pre 1930 businesses of THAMES, New Zealand. This information is kept at THE TREASURY in Thames - available for researchers (who visit or request paid research). What is becoming apparent is the number of people that tried their luck at Thames. We often associate this just with mining but people were coming to the Thames to test the commercial waters. 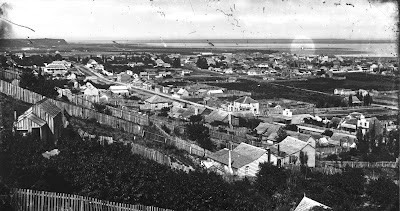 While bankruptcy was a regular event, many did also have success and went on to have long, successful businesses in Thames and New Zealand. Fascinating stories continue to emerge, as well as advertisements that give a wonderful view of what life was like over a hundred years ago. Take the new typewriter available for sale at C CATER's music shop in Pollen Street, Thames. The Pioneer Families Register at The Treasury (The Coromandel Heritage Trust), provides a great start for researching families of the wider goldfield region. "The Pioneer Family Register is a collection of forms filled in by people with early family in this region, under the umbrella of The Hauraki Thames Indexing Group. We have had an amazing response to this project, with forms arriving from all over New Zealand, and from overseas. Frequently people have sent in extra information, or provided a photoand these are filed separately. Some have sent in family history books as well. The forms contain much interesting information about our early settlers - where they came from, the boat they came out on, their interests, their children's names, as well as the dates for these events where known. On the reverse side is the name of the person submitting this information - so a family researcher wanting more information has the address of someone to contact." If you have infomation on a family who settled on the Thames Goldfields pre 1900, please consider completing the form today! - you then may find some new family researchers in the weeks to come. In the past week I have had the fortune to meet some new Vercoe researchers, thanks in part to this collection and a visit to The Treasury.